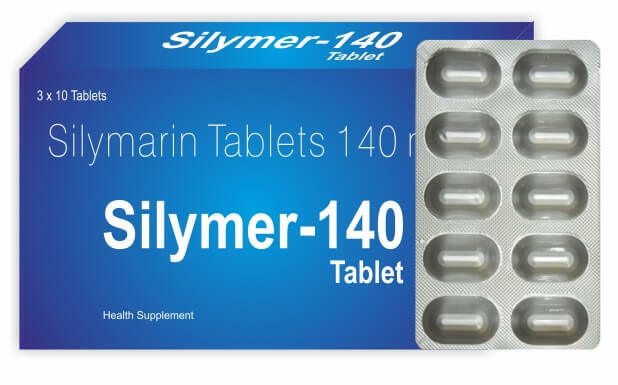 Silymarin tablet is a safe health supplement for those consumers who are suffering from hepatic problems. Silymarin is a potent antioxidant and stabilizer of the liver cell membrane and other inner biological membranes of different intercellular organelles. Silymarin apparently promotes liver cell protein synthesis and decreases the oxidation of glutathione (major antioxidant). Hepatic disease is a global public health phenomenon that has continued to rise due to cases of excessive consumption of alcohol, inhaling of harmful gases, intake of contaminated food and drugs. External factors such as prior meals, physical activity, temperature, and weather may influence the subjective sensations. The active ingredient or liver-protecting compound in milk thistle is known as silymarin. This substance, which actually consists of a group of compounds called flavono-lignans, helps repair liver cells damaged by alcohol and other toxic substances by stimulating protein synthesis. By changing the outside layer of liver cells, it also prevents certain toxins from getting inside. Silymarin also seems to encourage liver cell growth. It can reduce inflammation (important for people with liver inflammation or hepatitis), and has potent antioxidant effects. Silymarin works through several different mechanisms. First, as an antioxidant it quenches cell-damaging free radicals. Second, it suppresses the activity of tumor necrosis factor-alpha and interleukin-6, and therefore has anti-inflammatory properties. Third, it has cytoprotective (cell-protecting) benefits that have been demonstrated specifically in liver, pancreas, kidney, and brain cells. Pregnant and lactating mothers should not take any single supplement in higher-than-normal doses unless recommended by a health-care provider for a special condition. The combination should only be used in pregnancy and lactation if benefits outweigh the risks. Consult your Doctor before taking any medicine during Pregnancy and Lactation.